Guide to the Gallery is a site-specific project which explores various aspects (architectural, historical, urban etc.) of the Forum Gallery, a gallery space in Zagreb which was founded (1969) and run by a group of artists. Vodič kroz galeriju je site-specific projekt koji se bavi različitim aspektima (arhitektonskim, povijesnim, urbanim itd.) Galerije Forum, galerijskog prostora u Zagrebu koji su osnovali (1969) i vodili umjetnici. Script for audio recording: Pedestrians walking down Teslina ulica [street name] often peer into the Gallery, but the majority don’t come in. Perhaps someone’s gaze will slip over you passing as you stand with headphones on, looking at the street. Antonija, a sales assistant from the Babell designer clothing shop, just across the way, has noticed that most passersby stop in front of the Gallery after 1 p. m., when the Gallery is already closed. Some of them then press their nose against the glass and peek inside. Antonija thinks that because of such curious people it would be a good idea to leave a light on in the Gallery even after working hours. She has never yet entered the Gallery, but from her place she can see everything that is going on here. She likes art and is into photography, and has even turned this hobby of hers into second job. At the weekend she photographs weddings, and aslo does what is called baby-art photography. If by chance you happen to be in the Gallery in the evening, a bit before 8. p. m. you might in the same shop across the street notice a sales person from the afternoon shift a few minutes before closing time putting on her jacket and scarf and waiting behind the counter dresed like that for the end of working hours. Sometimes the occasional confused pedestrian will suddenly stop in the middle of the street and then the next moment hurriedly go back whence he came. It also happens that waiting for a friend, some casual passerby will walk pensively up and down, just like the young chap with the red scarf, just opposite you, on the other side of the street, below the signboards for the Pocrnić Lawyers’ Office and Kosa Hair Salon. On one of the bells at number 15, instead of the surnames of the residents it writes just Kate an Marko. The other bells are properly marked with the surnames of their owners: Rak, Lazić, Nedić, Drenški… Out of the entrance way cross the street occasionally come workmen pulling a metal cart of unknown purpose after them. It’s not clear what shop they com from. Not form Bokić Philately for sure. Perhaps from the cobbler’s in the shabby courtyard building at 15C, from which a piece of guttering has fallen off. While on the whole it is well turned out ladies and girls who enter the shop called Karla, it might be said that the nearby fast food restaurant Pizza Duck is patronised by members of all classes, from the homeless to the wealthy. On the first floor of the building across the way the striped roller blinds almost never move. In the evening there is very seldom any light turned on in one of the flats on the second floor… Sometimes working men drag some vast load down street, creating a fantastic row. Every Saturday, the little blue Friend of Children train goes regularly along the street. 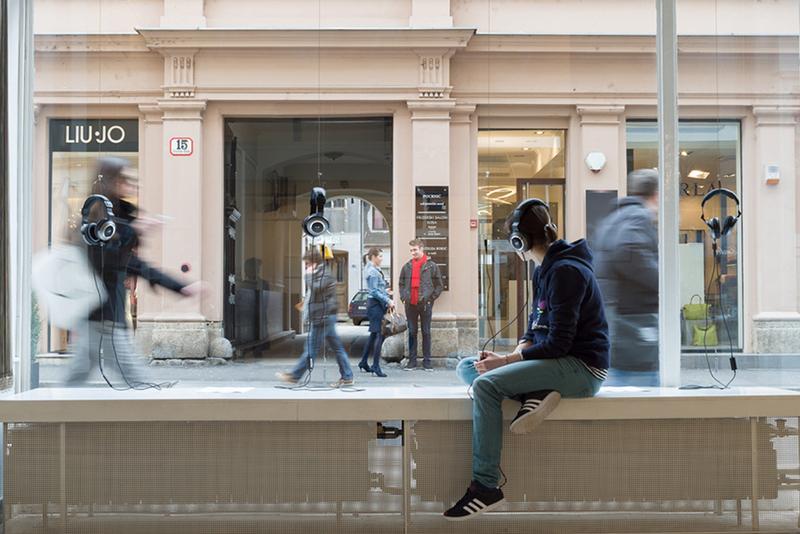 Audio recording Street tells of the outside world behind the glass of the Gallery’s window. A voice of the narrator tells a story from which the visitor can find out what goes on in the street and in the yard opposite the Gallery. He can also listen about a shop assistant from the shop over the way and find out the names of the tenants on the bell pushes in the passage across the street… An integral part of the story is also an extra, a stroller with a red scarf, who is standing in front of the Gallery window display during the time the exhibition. Audiozapis Ulica govori nam o vanjskom svijetu iza stakla izloga Galerije. Glas naratorice priča nam priču iz koje posjetitelj može saznati što se događa na ulici i u dvorištu nasuprot Galeriji. Također može saznati nešto o prodavačici iz trgovine preko puta kao i imena stanara na zvoncima u kućnoj veži… Sastavni dio priče je i statist-šetač sa crvenim šalom koji za vrijeme trajanja izložbe stoji ispred galerijskog izloga. script for audio recording Marija: A tall, slender girl with long brown hair who will help you getting the MP3 player to work if need be, will invite you to sit at her desk, reply to any questions about the exhibition you might have and perhaps blush a little if you look at her fixedly for a few moments: Marija Borovičkić – gallery guard of the exhibition in the Forum Gallery. Marija has lived in Zagreb seventeen years, but she is still very much attached to Korčula, where she spent her childhood and where part of her family lives. Until recently she would spend several months a year on the island, mainly because of the jobs about olive growing and the ecological traditional production that her family deals with. She took a degree in art history, ethnology and cultural anthropology at the Faculty of Philosophy in Zagreb. During her studies, she had various part-time jobs to make a bit more money. For years she worked in sports tourism, guiding holidaymakers on free climbing, kayaking on rivers and sailing. The rivers and the sailing have given her the finest moments in her life. She also had a few months interning at Lauba, house for people and art, in Zagreb, where she acted as guide, wrote articles and was curator at the Marko Tadić exhibition. She has been working in the Forum Gallery since the beginning of the year as volunteer, gallery guard and she will be a Gallery intern soon. She does her guiding spontaneously, with those who like to talk and listen. Sometimes the visitors do the guiding. The average age of the visitors is about 60, and sometimes there are 70-year-olds, octogenarians… – on the whole people who have been keeping up with the work of the Gallery since they were young. She can listen for hours to the stories of these people about their lives, the artists, events and the city the way it was once. Marija clearly has a soft spot for that „city as it once was“. Sometimes the homeless come into the Gallery. Although they most often beg, once a man with a dog came in and really delighted her. He spoke about Kulmer and his paintings with as much self-confidence as if he were a professor at the Academy. At first, it was all very strange, and then it turned out that for a long time he had been at model in the Academy and had learned a lot. Audio recording Marija tells a story about the Gallery’s guard Marija. She will herself offer the visitor an MP3 player and headphones. The voice of the announcer tells us the simple, informative but also poetic story about Marija. The visitor will find out some details about her origin, education, her affinities, her earlier jobs and her experience of work in the Gallery. Audiozapis Marija govori o čuvarici galerije Mariji. Ona će sama posjetitelju ponuditi MP3 uređaj i slušalice. Glas naratora pripovijeda nam jednostavnu, informativnu ali i poetičnu priču o Mariji. Posjetitelj će tako saznati neke detalje o Marijinom porijeklu, obrazovanju, sklonostima, ranijim poslovima kao i o dosadašnjem radu u Galeriji. 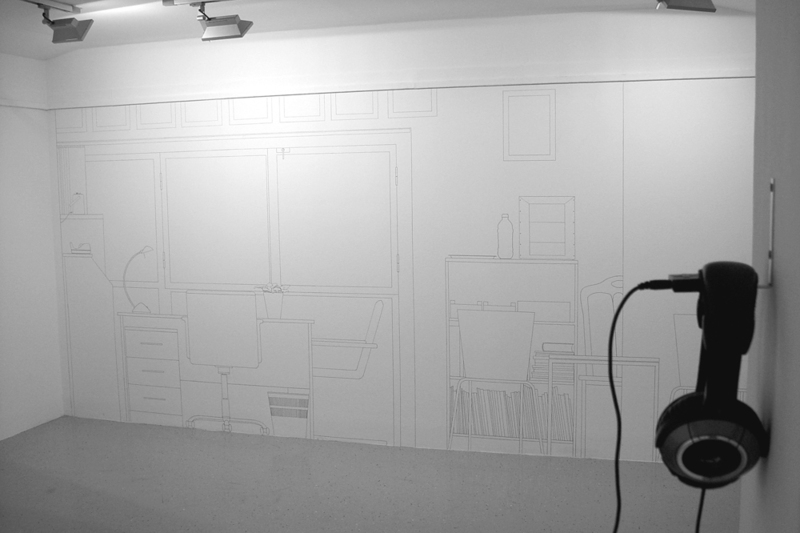 script for audio recording: The drawing on the wall is an elevation drawing showing in life size the office of the manager of the Forum Gallery that lies behind the wall. The room is equipped with the usual office furniture. There are two desks, books on shelves, file holders and exhibition catalogues, a coffee table and two chairs. On the walls there are photographs of founders and members of the Forum Gallery, photographs from various vernissages, a framed poster for New Year Selling Exhibition of 1981 and Exhibition of Artists of the Forum Gallery of 1988, telling of the rich and interesting history of the Gallery. There are a few more details that make office life a bit more pleasant: a small radio on a white shelf, a coffee machine, a violet in a decorative pot on the desk. Before it was changed into an office, this room was for many years used as a silkscreen printing workshop, in which the Gallery’s members printed the posters for their exhibitions. The big window with the view onto the inner courtyard provided enough daylight, welcome for work in the studio. In the room opposite the office, in which the archives are located today, there was one more printmaking workshop, and the Gallery also had a photographic lab. In this way the Forum Gallery, a unique specimen of an exhibition space founded and run by artists, enabled its members not only to have control over the programme and the way it was directed, but also a high quality production framework in which to realise their works. The drawing on the wall is an elevation drawing showing in life size the office of the manager of the Forum Gallery that lies behind the wall. The drawing is accompanied by a sound recording that tells us of the contents of the office, the furnishings and other items as well as about its history. Crtež na zidu je bokocrtni prikaz u omjeru 1:1 ureda voditelja Galerije Forum koji se nalazi iza zida. Uz crtež ide i audiozapis koji nam govori o stvarima, namještaju i drugim sadržajima koje se nalaze u uredu kao i o povijesti Galerije. The series of drawings Richter is based on drawings sketches for furnishing of the architect Vjenceslav Richter who at the end of the 1960s designed the whole of the interior of the Gallery. However the sketches were almost forgotten and no piece of furniture for gallery and its workshops was ever made after them. The series of drawings Richter recalls this forgotten aspect of Gallery’s history. Serija crteža Richter temelji se na nacrtima za namještaj arhitekta Vjenceslava Richtera koji je krajem 1960ih projektirao interijer galerije. No ti nacrti za namještaj za Galeriju i prateće radionice gotovo su zaboravljeni pa namještaj prema njima nikada nije bio izrađen. Serija crteža Richter podsjeća na taj zaboravljeni aspekt iz povijesti Galerije. Anything that might recall a conventional set up, anything suggestive of gallery venue as recipient for objects of one kind or another is only dubious and provisional at the Božena Končić Badurina exhibition. The twenty five pencil drawings, small in size, modestly framed in natural wood with glaze of transparent white paint, visually tend towards a loss of their physical nature, that is, towards merging with the whiteness of the walls. Accordingly, although they are the only classical exhibits at the show, they do not serve for some story unrelated to the given setting; rather, they are in fact instructions for an unhurried and contemplative use of the space of the Gallery. This particularly refers to Suggestions, fourteen succinct, instructive pencil drawings after photographs that indicate how to move and to stand in a space for relaxation and meditation, not for the traditional consumption of the art on its walls or wall surface. The drawings suggest leaning against a pillar, sitting on the steps, relaxing in a reclining position on the wooden space alongside the window display of the Gallery. Depending on whether the visitor wants to use these possibilities, their angle of vision switches the attention and directs it to the space currently occupied. Furthermore, with drawings of the same format, technique and framing, in an interpretation of sketches for furnishing of the architect Vjenceslav Richter, who at the end of the 1960s, when the Forum Gallery was founded and started working, devised the whole of its interior, the present artist draws attention to the architectural conception of the Gallery and its past. Apart from these recent drawings aranged in the ground floor and the first floor, the artist has also made a large linear wall drawing in marker. On it, in latteral elevations, on a scale 1:1, in an ‘X-ray’ depiction, the office of the manager of the Gallery that lies behind the wall is depicted. The drawing is also accompanied by a sound recording that tells us of the contents of the office, the furnishings and other items as well as about its history. Thus, looking at the elevation drawing we learn, among other things, that the office was once occupied by a graphic workshop, with next to it a photographic laboratory. In this way, the guide informs us, the Forum Gallery, a unique specimen of an exhibition space founded and run by artists, enabled its members not only to have control over the programme and the way it was directed, but also a high quality production framework in which to realise their works. Going downstairs to the ground floor again, if they did not already do so when they arrived, the visitors will have the chance to hear the story about the Gallery’s (lady) custodian. She will herself offer the visitor an MP3 player and headphones and sitting opposite her, from the simple, informative but also poetic text by the author on the recording, they will find out some details about her origin, education, her affinities, her earlier jobs and her experience of work in the Gallery. The voice of the announcer will tell us at the end that Marija (the custodian) is delighted by the Gallery’s total openness onto the street… People sometimes tap on glass, which vibrates, and then she feels like a fish in an aquarium. The equally agreeable audio recording Street also tells of this outside world behind the glass of the Gallery’s window, a story from which the visitor can find out something about Antonija, a shop assistant visible through the window of the shop over the way, about her angle of vision and viewpoint on the Gallery, which she looks at everyday from her workplace, but which she has never yet entered; listen about what goes on in the yard opposite the Gallery; find out the names of the tenants on the bell pushes in the passage and have his or her attention drawn to the striped blind on the first floor of the opposite building, which is almost never raised. The artist supplements the story of the neighbourhood by taking on an extra, a stroller with a red scarf, who in front of the Gallery window display during the time the exhibition is on will bring a note of the artificial into the existing spontaneous street traffic. In this manner the daily goings on outside seem to be promoted as a whole into some directed, theatrical or filmic event that we follow on stage, on the screen, in the proscenium of the gallery window wall. This exhibition is the most recent and ‘the most finished’ in a series of the artist’a appearances in the last few years, in which she, irrespective of whatever media forms are involved, shifts the framework of perception and opens up the possibility for a more vigorous sense of space, of one’s own body, mind, interaction with another person. All this in a way to which intrusiveness, spectacle, aggression and incongruity are foreign… On the contrary: silence, whiteness, light, shadow…; slipping aside, slowing down, halting, immobility; self-abnegation, absence, defensiveness, lastingness… these are the attributes and categories that mark her thinking, behaviour and work. In the case of this exhibition, with her discreet means Božena turns the Gallery itself into exhibit. Reacting actively to the exhibition space, the artist animates its actually not very emphasised aspects, both as pre-text for her own creation and as proposal to activate the visitor, whose usual routine of art consumption is disputed. But in return, she offers the chance for a new accession of reality, for the opening up of mental spaces, for becoming conscious of his or her own perhaps somewhat rusty spiritual potentials. The Božena Končić Badurina exhibition is the first in a programme cycle of the Forum Gallery started under its new management. The significance of this exhibition points up this starting position, that is, it presents a kind of paradigm of the ambition for the Gallery to be made aware of as space and to be regenerated as place of live permeation with its context, narrower and broader, urban and cultural, and with the better part of its own tradition. Sve ono što podjeća na konvencionalni postav, odnosno što upućuje na galerijski prostor kao na recipijent za umjetničke objekte ove ili one vrste, na izložbi Božene Končić Badurine dvojbeno je i uvjetno. Tako dvadeset pet crteža olovkom, manjih formata, uokvirenih u decentno, lazurnim bjelilom premazano natur-drvo, vizualno tendiraju gubitku svoje fizičnosti, odnosno stapanju s bjelinom zida. Dosljedno tome, iako jedini klasični eksponati na izložbi, nisu u funkciji neke priče nevezane za konkretni ambijent, nego su zapravo napuci za polagano, kontemplativno korištenje prostora Galerije. Posebno se to odnosi na Sugestije, četrnaest sažetih, instruktivnih, prema fotografijama nastalih crteža olovkom, koju upućuju na kretanje i zastajanje u prostoru kao mjestu odmora i meditacije, a ne tradicionalnog konzumiranja umjetnosti na galerijskim zidovima ili podnoj površini. Crteži sugeriraju naslanjanje na stup, sjedenje na stepenicama, opuštanje u ležećem položaju na drvenoj plohi uz izlog Galerije… Neovisno o tome hoće li se namjernik koristiti tim mogućnostima, njegov se rakurs mijenja i pozornost usmjerava na sam prostor u kojem se nalazi. Nadalje, crtežima istog formata, tehnike i preme, interpretacijom skica za namještaj arhitekra Vjenceslava Richtera koji je potkraj šezdesetih godina poršlog stoljeća, kada je Forum osnovan i kad je počeo s radom, osmislio i cjelokupan njegov interijer, autorica upozorava na arhitektonsku koncepciju Galerije, kao i na njezinu povijest. Osim tih decentnih crteža raspoređenih u prizemlju i na katu, autorica je izvela i veliki zidni linearni crtež flomasterom. Na njemu je bokocrtno, u omjeru 1:1, ‘rendgenski’ prikazan ured voditelja Galerije koji se nalazi iza tog zida. Crtež prati i audiozapis koji nas informira o sadržaju ureda, namještaju i drugim predmetima, kao i o njegovoj namjeni u prošlosti. Tako, promatrajući zidni bokocrt, uz ostalo saznajemo da je na mjestu ureda nekad bila grafička radionica, a u susjedstvu fotografski laboratorij. Na taj način, upućuje nas vodič, kao jedinstveni primjer izložbenog prostora koji su osnovali i vodili umjetnici, Galerija Forum je svojim članovima osim kontrole nad programom i njegova stručnog vođenja, omogućavala i kvalitetan produkcijski ovir za realizaciju radova. Kada se s kata spusti ponovno u prizemlje, posjetitelj je, ako to već prije, po dolasku nije obavio, u prilici slušati priču o čuvarici Galerije. Ona sama ponudit će mu MP3 plejer i slušalice pa će, sjedeći nasuprot njoj, iz jednostavnog informativnog, ali i poetičnog autoričina teksta audiozapisa, posjetitelj saznati detalje o čuvaričinu porijeklu, školovanju, afinitetima, prethodnim radnim mjestima te iskustvu rada u Galeriji. Saznat će da je riječ o povjesničarki umjetnosti koja čuva izložbu, ali ujedno i stažira u Galeriji. Glas spikerice informirat će nas na kraju da je Marija (tako se zove čuvarica) oduševljenja potpunom otovrenošću Galerije prema ulici… Ljudi joj ponekad lupkaju po staklu koje vibrira i tada se osjeća kao ribica u akvariju. O tom vanjskom svijetu iza stakla izloga Galerije govori jednako lijep audiozapis Ulica, priča iz koje posjetitelj, uz ostalo, saznaje nešto i o Antoniji, prodavačici vidljivoj kroz izlog trgovine preko puta, njezinu rakursu i viziji Galerije koju svakodnevno sa svojeg radnog mjesta gleda, ali u nju još nije ušla; sluša o radnjama iz dvorišta nasuprot Galeriji… Saznaje imena stanara na zvoncima u kućnoj veži, upozoren je na prugaste rolo-zavjese na prvom katu nasuprotne zgrade koje se gotovo nikad ne podižu. Priču o ulici autorica dopunjava i angažmanom statista-šetača sa crvenim šalom koji za trajanja izložbe ispred galerijskog izloga unosi notu artificijelnog u postojeći sponatni ulični promet. Na taj način, dnevna vanjska zbivanja kao da se u cjelini preoblikuju u neku vrstu režiranog, teatarsko-filmskog događaja koji pratimo na pozornici/ekranu galerijskog prozirnog zida. Ova izložba posljednja je i ‘najdovršenija’ u nizu autoričinih nastupa posljednjih godina, u kojima ona, bez obzira na to o kakvim se medijskim oblicima radi, pomiče perceptivne okvire i otvara mogućnosti intenzivnijeg osjećanja prostora, vlastita tijela, uma, interkacije s drugim. I sve to na način kojemu je strana nametljivost, šarenilo, spektakularnost, agresija… Naprotiv – tišina, bjelina, svjetlo, sjena…; izmicanje, usporavanje, zastajanje, nepomičnost…; samozatajnost, odustnost, defenzivnost, dugotrajnost… atributi su i kategorije koje obilježavaju njezino razmišljanje, ponašanje i rad. U slučaju ove izložbe, Božena diskretnim sredstvima pretvara samu Galeriju u izložak. Reagirajući aktivno na prostor izlaganja, umjetnica animira njegove inače neistaknute aspekte, istodobno kao predtekst vlastite kreacije i kao prijedlog aktiviranja posjetitelja kojemu pritom osporava uobičajenu rutinu konzumiranja umjetnosti. No zauzvrat pruža mu priliku za novi prijem stvarnsoti, za otvaranje novrih mentalnih prostora, odnosno za osvještavanje vlastitih zanemarenih duhovnih potencijala. Izložba Božene Končić Badurine prva je u programskom ciklusu Galerije Forum koji počinje njezino novo vodstvo. Svojim značajem ova izložba i ističe tu startnu poziciju, odnosno predstavlja neku vrstu paradigme nastojanja da se Galerija osvijesti kao prostor i regenerira kao mjesto živog prožimanja sa svojim užim i širim kontekstom, urbanim i kulturnim kontekstom te boljim dijelom vlastite tradicije.